Actually, horses ARE bred for this. Hundreds of years of selective breeding to produce a horse with the bone, conformation and stamina to do the job easily. This is not an issue. There are BLINDINGLY horrible animal welfare cases everywhere, everyday, yet people take one incidence twist it into their own agenda filling diatribe, and everyone loses their minds. Well said. Theres hundreds of thousands of “pets” thst a malnoirished and mistreated in Australia but people only jump up and down when theres a video on the internet. Horses that arent galloping can do so on hard surfaces. Infact a way to overcome shinsoreness in a horse is to walk it on hard surfaces as it conditions the legs. But hey. What do actual horse people know about the maintinence and care of the animals they love. my god how about you go breath those fumes into your lungs at close quarters daily, whilst you stand on hard ash-felt in all conditions pulling heavy loads that are unsteady all the while battling traffic and being restricted on any natural grazing(which by the way as your so keen on what they have been designed for, Horses are herbivores and as such have a digestive tract that should be constantly catered to by 24hr access to grazing or forage, not standing for 16 to 18hrs a day waiting to eat or drink)Horses have NOT be selectively bred, they have been used and abused by man to profit from since time began, and its time the human race evolved. Carriages have no place in a modern city, if you want carriage rides get them out of city areas. Umm yes they are bred to pull carriages… Many hundreds of years of breeding infact. At the end of the day it is all about making money. The general public haven’t a clue of the harm that’s being done to these long suffering animals because on the surface it all looks so perfect. The more publicity the better, education is what is needed, and then things will change. Poor Horse’s the human’s should be charged with animal cruelty and given a huge fine!! No evidence of animal cruelty here, only allegations based off miss-information and lies. It was reported that lawyers were saying there was a very strong case for a defamation lawsuit. Well said. Thank you for sharing this. You may not be aware, but the cover photo that is accompanying this post in newsfeeds shows a September 2013 accident from New York City, and it would be a more powerful story for you to show a photo of the white horse. You have some excellent photos in this blog post. Use them!!! Thanks for the feedback! WordPress seems to have chosen the cover photo for this post. I selected the white horses as the title image but the photo being shown on the shared link is still the brown U.S. horse. I’ll work on getting this fixed when I get home and see if it can be changed. It is cruel to the animals and not acceptable in this day and age to continue to allow A practice that is harmful to animals. Melbourbe you are more intelligent and aware, more educated and kind than this. 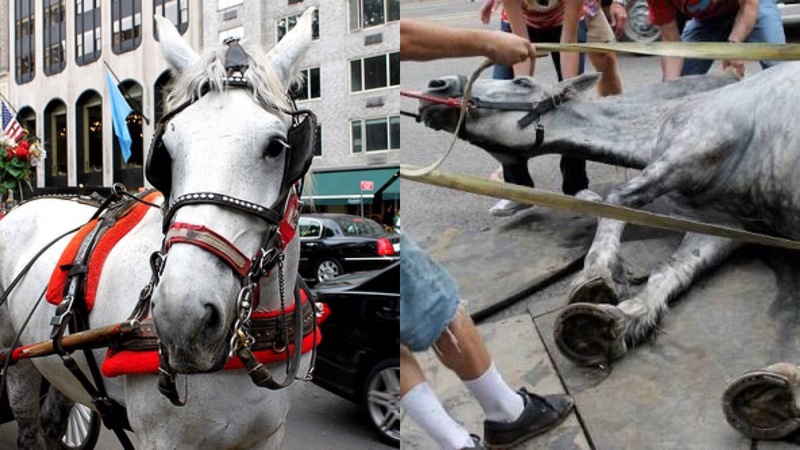 Pease help us stop the business of horse cruelty in the city of Melbourne. Thank you on behalf of all the pretty horses. Best to amend this post, since the author of the video has publicly retracted his comments, wihdrawn the video and apologised to the business for making it all up. The horse slipped, fell, and was back on his feet completely unharmed in minutes. I also took the time to follow the YouTube back to the original filmer as their fb page is linked, they have aplogized to the carriage owner fir the misrepresentation. Your lack of research and supporting evidence of your claims actually made me laugh. This is not animal cruelty. In fact, these horses receive the very best in care! How do I know? Because this is my job!!! I drive a carriage with a beautiful big shire whom, I can assure you, receives the absolute best care! He was selectively bred to pull the carriage he drives. He has the best carrier to make sure his hooves are well maintained to suit his job, he has the best diet, is offered water every half an hour (not that they drink this often), is not driven on a day when it is above 36 deg, has his own personal chiropractor for weekly maintenance to make sure he is sound, he is stabled rugged and brushed every day, and most of all, he LOVES his job! So take your apparent rumoured ‘abuse’ spreading elsewhere. There certainly is plenty of it out there, just not here. They ARE bred for this and DO enjoy it. I know a school horse in his late 20’s, they retired him, but when they go to collect the other horses, he stands at the gate, wanting to go out. If they leave him behind, he stands at gate. They realised he wants to work, so just put beginners who walk only on him. My grandfather retired his work horse abd noticed her acting strange, coming to the gate, so he harnessed her. up and gave her a slab to drag around her paddock so she thought she was working. I didn’t get up to ride my horse for 4 days just last week. When I got there, my horse came galloping up to me, put his own head in halter, when I bridled him, he couldn’t open his mouth quickly enough, he actually had his mouth open and waiting for me. I think he missed me. Lets talk race horses, I agree they start them too young, before bones have finished growing. 2 yr old racing should be banned and it would cut down on many injuries. But I can tell you, tbe ones that win, love it, those that don’t get retired quickly. They are no differdnt to any other athlete, you can train stamina and strength and fitness, but you have to have the will to win. Most horse owners know if their horse likes jumping, dressage, or trail riding, they tell us in their own way and go sour if we try to push them in a didcipline they don’t enjoy. You can romantacise about wild horses all you like, but in the wild they live to about 15, have worms, bad feet. In captivity, they live til about 30. Exactly. Horses like having jobs to do. Most thrive off it. What manner of crap is this? Remove the whole post you bunch of peckerheads before you get sued. First the teen who posted the video is threatened with legal action, now me? Pfft. You don’t frighten me. I feel very depressed reading some of these posts, if you have empathy with horses, try and see it from their side, or put yourself in their position. At rest horses breath 150 litres of air per breath, and they have not evolved to breath in pollution. Horses do not deal with stress very well, at best they just shut down, they are also herd animals and need to be near other horses, their legs cannot take the jarring on tarmac day after day. I would hope that these owners give their horses time off in the country, where they can live a more natural life for a time, that is the least they can do for them, and do they? Does anyone know? And to end, if I was a horse and have a choice, I would rather be free and live a shorter happier life in the wild with my family band, as I was meant too. Good on the post author, I am right with you!